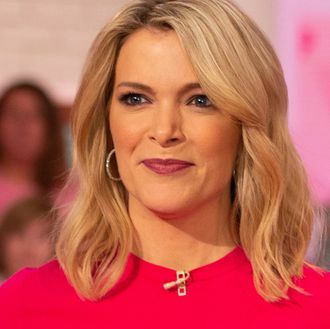 Deadline is reporting that cast members from Netflix’s House of Cards have pulled out of a scheduled appearance on the seemingly ill-fated Megyn Kelly Today. Womp, womp. Netflix confirmed on Wednesday night that no cast members would appear on the show. Sources also told Vulture that Robin Wright was not among those scheduled to appear. Though the streaming service didn’t give a specific reason for the cancellation, it came right after Kelly went on national TV earlier this week to announce she doesn’t understand why blackface is offensive. She then looked around, scoped out this hill, decided it wasn’t actually the one she wanted to die on, and apologized, saying, “I believe this is a time for more understanding, more love, more sensitivity and honor.” It could also just be a time for Googling things before you talk about them on TV. Update, 10/25, 3:54 p.m.: In an interview with Michelle Collins on her SiriusXM show, House of Cards cast member Greg Kinnear said that he and his team were told the reason their appearance on Megyn Kelly’s show was canceled was because she had jury duty. “There was a lot scheduled this week and I believe we were at some point, that was maybe, we were going to go by there,” Kinner said, “but obviously, um, I think she’s at jury duty today?” Collins pressed Kinnear, insisting that the jury duty line was a lie from Kelly’s team. Kinnear, however, asserted that he believed the excuse was real, and that they heard from Kelly before the controversy about her discussing blackface on air. Kelly went on hiatus Thursday, perhaps permanently, in the wake of the controversy.